Nicole gained a first class honours degree in Computer Studies from the University of Teeside (UK) and has received hands-on training from researchers and renowned academics at the Massachusetts Institute of Technology (MIT). 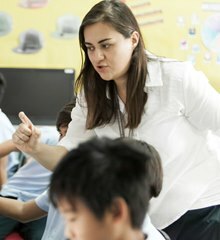 Nicole is a Computer Science and ICT teacher who teaches students across both Primary and Secondary schools. She is the school’s virtual learning environment (VLE) administrator for MOODLE. Nicole also provides strategic tech-coaching for teachers to ensure technology is used to transform learning in all classrooms around school.